.I had a conversation with the restaurant manager. He agreed to extend our time up to 23:30, so we can stay and enjoy longer. The kitchen will be closed at 22:00, but the bar will remain open. .I suggest to everybody show up before 20:00, so we all can order and enjoy dinning together. Alternatively you can use public transport, the closest station is LuisenForum. .Make sure that you won't have to drive home under influence. Drinking and driving don't go well together.
.	“ Protected content ” is not just a myth, it’s a life style. To immerse us even more in the ambient, Protected content has offered a free live belly dance performance for our gathering. It will start 8:30 PM. Don’t miss it! * Dear Internationers, we have reached our maximum number of attendees. It's understandable if some can't make it for any reasons, if so, please cancel your attendance asap ,preferably one day before to give us the chance to invite our friends who are in the waiting list to join. 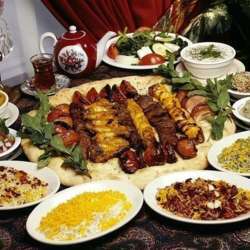 Let's meet and enjoy Persian cusine!